Many patients have a fear of the unknown! In many cases, this fear makes them avoid the care they need. This is tragic but it does happen. Do not let your suffering continue because chiropractic care could help you. When I was a graduate student in medical biophysics at the University of Western Ontario, I started to experience chronic and persistent neck pain. I figured that this neck pain was from the weird positions I would have my neck in as I was performing my research. I was tired of taking pain and anti-inflammatory medicine. I began looking for another option by reviewing the scientific literature. I discovered that the musculoskeletal benefits of chiropractic care were irrefutable. I was a skeptic as I had no prior experience or knowledge of chiropractic care prior to this point. I visited a chiropractor with the same fears as most people would have. After I received my first neck adjustment, I remember laughing out loud as the audible noises were like nothing I had experienced before. There was no pain with the treatment and I quickly recovered from my problem… that is the spinal adjustment removed the source of the irritation in my neck. That was the beginning of my story and this experience changed the course of my life. Now I help change the course of other peoples lives by trying to eliminate the source of their pain! After completing my Masters of Science in Medical Biophysics I knew that I wanted to become a chiropractor as I had experienced so much benefit from care personally. The problem was finding a way to make it happen. My Chiropractor at the time was very influential in helping me achieve my dream. He suggested that I use my research experience to advance Chiropractic as the profession could only be helped by more research. This was my moment; a point in my life where everything was clear. I have him to thank for this guidance. I decided to expand on my research interests and apply them in the chiropractic profession. I wrote the president of Parker College and informed him that I had a better way to investigate the effects of spinal adjustments on the cardiovascular and autonomic nervous systems. After reading my proposals, Dr. James W. Parker, the founder of Parker College (now known as Parker University), awarded me a full tuition scholarship based on my working for the research department while going to school. I published 3 articles from this work in the Journal of Manipulative and Physiological Therapeutics. My most recent publication entitled “Prevalence of cardiac arrhythmias in a community based chiropractic practice” was published in the Journal of the Canadian Chiropractic Association (JCCA 2014; 58(3):238-245). I am happily married for 20 years and have 2 wonderful children ages 17 and 14. My daughter is an excellent singer and actress while my son loves singing and swimming. We all love musical theatre and have been casted in musicals such as Peter Pan, the Wizard of Oz and Mary Poppins. I love being on stage with them and what an ABSOLUTE JOY it is to see them develop into such confident young people! Living a healthy and fulfilled life is what we all want! This goal requires effort. I am no different than you in this regard. We strive to eat well and exercise and incorporate chiropractic care as part of our health plan. We get adjusted regularly and I check my children on a monthly basis to address any spinal fixations or restrictions before they amount to a bigger problem. Our children learn by our example. My regular office hours are Monday from 8 am-5 pm, Tuesday from 8 am-8 pm, Thursday from 8 am-6 pm, Friday from 8:30-noon and Saturday from 9:30 am to noon. Appointments on Tuesday after 6 pm and on Saturday are by appointment only. Enough about me! 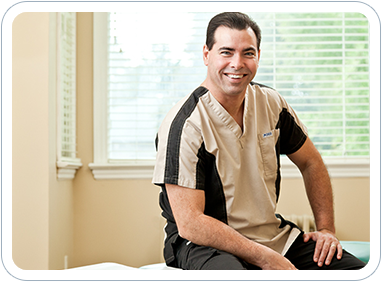 I consider myself a great listener and I look forward to meeting you in person and discussing your health concerns. Give our Thorold office a call or click here to email me.